Mike and I are on a mini-vacation right now, and have enjoyed time with friends and family over the past few days. Mike’s vacation is over now, as the purpose of our travel was actually for him to attend a work training today and tomorrow, but it’s allll vacation for me! 🙂 Today I am writing in comfort and peace, but from my parents’ home instead of my own. Psalm 139 is a treasure trove of wisdom and truth that informs our hearts of the work and character of God, seen through the lens of David’s appropriate response to God’s perfect character and acts: wonder, awe, praise, and a desire for righteousness. This verse supports several fundamental truths about God that we find throughout the Bible: he is our creator, he loves and cares for us, he sets his people apart, and he enjoys his craftsmanship. When I saw that this verse was coming up, I contemplated it briefly and thought, “Is this going to be a body image post?” Because it could be. 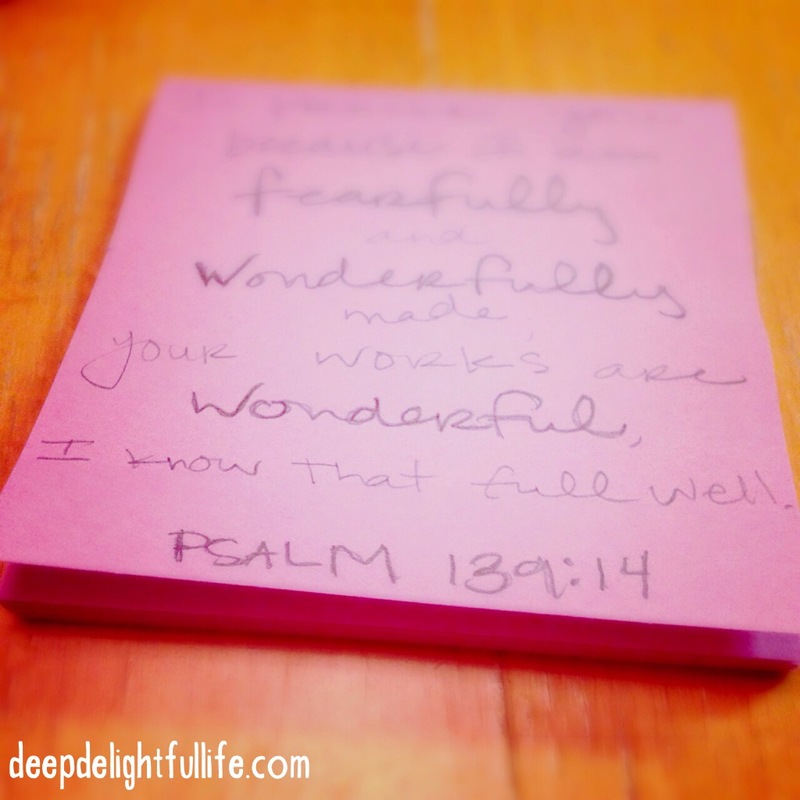 I cannot say I know full well (like embracing or living in) the truth that I am wonderfully made as a work of God. I may know it, but I don’t always live it. Trust me, I’m working on it. I am trying to navigate around the pervasive (and sometimes simultaneous) “hate your body” and “love your body” messages I hear from our world and pursue the message of the Bible. The Bible tells me that my body is a work of God, something I should respect and care for, a dwelling place for the Holy Spirit, but also imperfect and not my permanent home. I sometimes find myself internalizing the messages of the culture more than God’s message found in the Bible, and that is a concern to me because my desire is to live God’s way in every area of my life, even if it kills me… which it will, because I cannot achieve that goal on this side of eternity. But I digress. When I read this verse I am reminded of my need for God’s renewing work in my mind so I can see myself as he sees me. It is something he does through his power, but only when I yield to him and allow him to do the work. When I recognize that I am God’s creation– his child– and that he sees me as wonderful, I can be kinder to myself. I can be grateful for the ability to get up in the morning and take breath after breath as I walk through each day. I can be grateful even when the days bring pain or sadness, because my body still has the strength to endure it. I can appreciate the physical things, like my eyes opening and my legs carrying me around, but I can also appreciate that my mind and soul are alive and growing. The broad message I’m drawing from this verse is to live in light of being one of God’s wonderful creations. Right now for me that means aligning myself with God’s message and allowing him to work in my mind, which leads me to be kind to myself when the world tells me I’m not good enough. I can also share God’s perspective with people who are hurting because of the messages they hear and believe from our culture. What does this verse say to you?